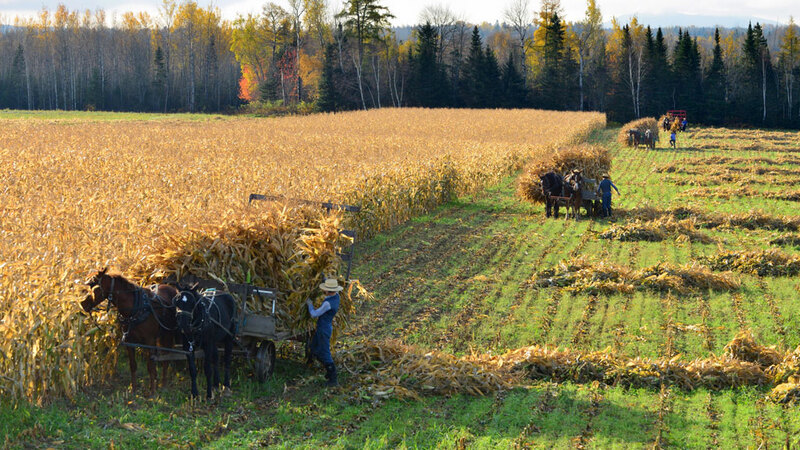 At the northeastern tip of the country, Maine’s far-flung Amish work together to survive. This story originally ran the December 2013 issue. [L]ately, Noah Yoder has gotten into watch repair. He’s a craftsman at heart, and the clapboard workshop on his 100-acre dairy farm in Fort Fairfield is cluttered with the tools and tokens of his various artisan pursuits: a foot-powered lathe and a manual cleaning machine, a half-dozen wall-mounted cuckoo clocks, rolls of barn blueprints, handsome wooden rockers lined up like theater seats, multiple shelves of hand-dipped wax candles. 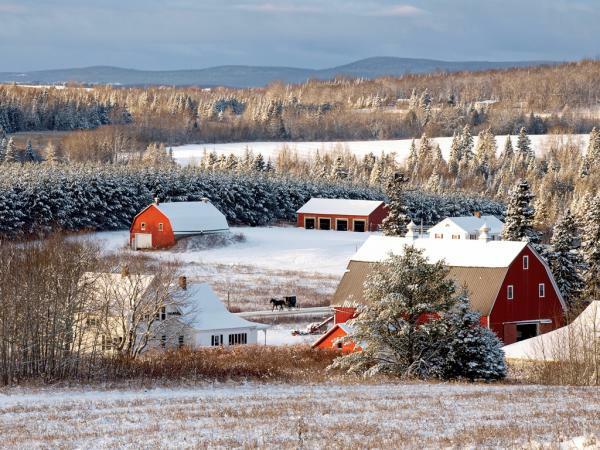 He especially likes tinkering during the long Aroostook County winters, when the warmth of the woodstove melts the frost from his beard and the fine details of carpentry and clockwork feel like a reprieve, a meditative break from the brute repetition of shoveling silage in a snowbound barn. Noah is still learning the watchmaking craft, having taken it up just a year ago, back in January, during what proved to be the most difficult winter of his life. What he appreciates most, Noah tells me, is the workmanship of an old “railroad-quality” watch, the way that such a mechanically simple object can stay true for generations if it’s built to the exacting measure of yesteryear’s timekeepers. 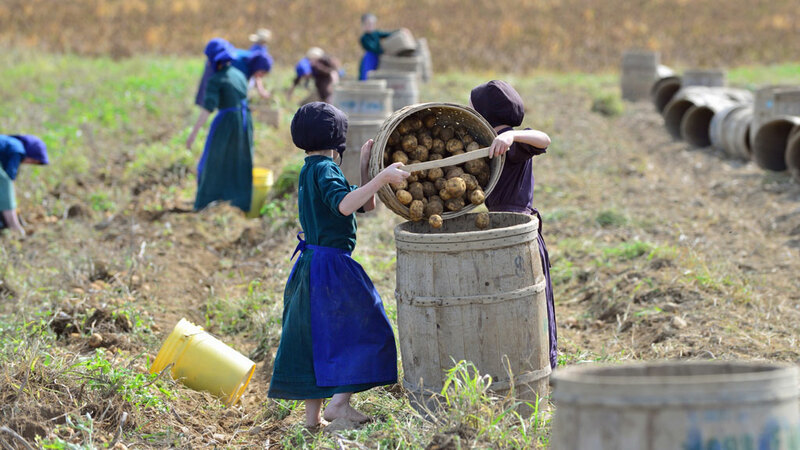 Simplicity, reliability, conformity to a standard: These are values that an Amish farmer can get behind. Contrary to countless lazy narratives about a culture “frozen in time,” a stopped watch makes a lousy metaphor for the Amish. A much better comparison is a finely tuned watch, one that derives its value from the precision performance of all of its parts. Noah arrived in Fort Fairfield in August of 2007 with his wife, Lovina, and their eleven children in tow. 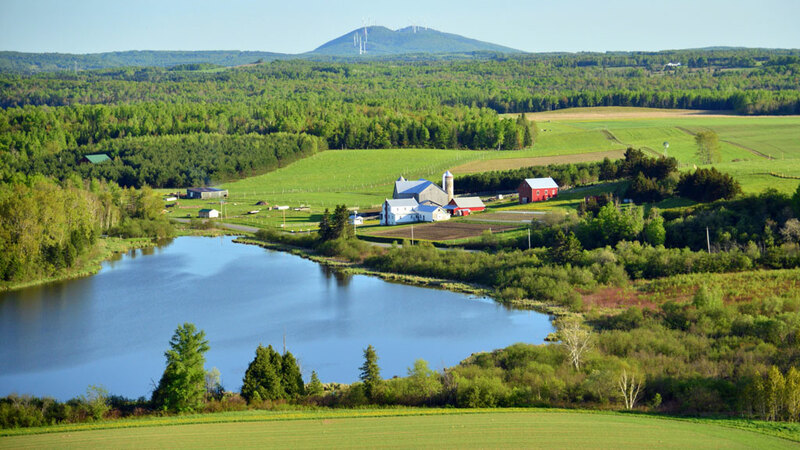 Together with his sister’s family, they came to Aroostook to start a new Amish settlement, leaving behind a community of some two hundred Amish families near Potsdam, New York. In Ontario, where Noah was born, there were more than 60 Amish families, and there were hundreds in the Ohio community where he grew up. Now there were only two of them, strangers in a strange land, faced with the task of getting two farms up and running before the onset of a winter that would break every snowfall record, eventually dumping nearly 200 inches on The County. Simplicity, reliability, conformity to a standard: These are values that an Amish farmer can get behind. “It takes a bit of pioneer spirit,” Noah confesses, sitting across from me in a homemade rocker among the bric-a-brac of his workshop. At 45, he’s a slight man with any easy grin, wire-rimmed glasses, and a beard shorter than you’d imagine for someone who hasn’t shaved or trimmed in more than two decades (most Amish men being forbidden to shave following their wedding day). He wears the same light blue, collarless shirt, suspenders, and navy vest as every other adult man in the Fort Fairfield Amish community. 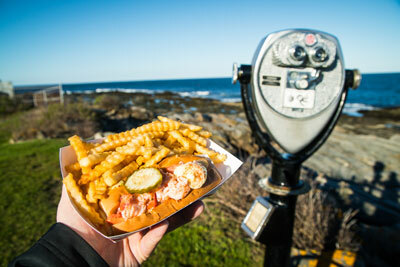 Noah comes from “a rambling family,” he admits, but it was more than just wanderlust that brought him to Maine. 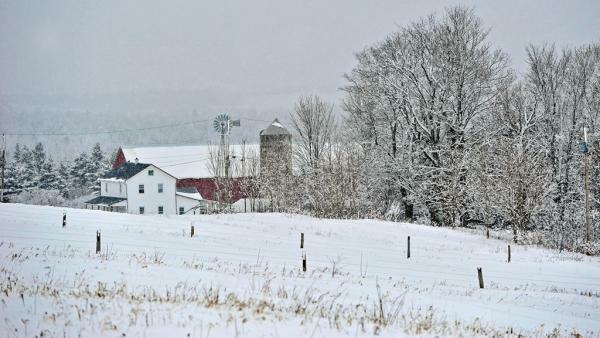 Back in upstate New York, affordable land was getting harder to come by, and the region’s Amish dairy industry was struggling. Noah worried about opportunities for his kids, and together with his brother-in-law, he made scouting trips to Maine for almost two years before deciding to strike out. Rolling up the interstate on a Greyhound bus in the summer of 2005, his first impressions were not positive. Then, in February of 2007, after exploring Corinth, Farmington, and elsewhere, Noah laid eyes on the Fort Fairfield countryside, just east of Presque Isle, a narrow strip of potato country that lines up like a crop row between U.S. Route 1 and the Canadian border. Farmland in The County was cheap and plentiful. The city was just an hour away by buggy. The growing season was short, but the soil was rich. And northern Mainers, he remembers, seemed warmer than their counterparts down south, although no one could fathom why he’d come up to visit in the dead of winter. “I told them we wanted to see the bad part of the year,” he says with a shrug. By August, the Yoders were hiring a returning potato truck to deliver what few possessions they couldn’t sell at auction. That fall, a busload of New York Amish made a whirlwind trip to The County to help them raise their first barn — bussing to Maine overnight, erecting the barn during the day, then catching the night bus home in time for the next morning’s milking. Noah and his brother-in-law labored well into February on another barn, picking the warmest days and working on the sunniest sides of the building. It was a long winter, but Noah remembers it fondly, and it didn’t take long before word of the new settlement traveled through the Amish grapevine. Three more families arrived in 2008. By the end of 2010, there were close to a dozen. Today, the Amish settlement in Fort Fairfield (and neighboring Easton) is made up of 20 families who have migrated from Ohio, Iowa, Missouri, and elsewhere — around 140 people altogether. In more ways than one, it is a young community. There are only three people over 50 years old. And while the settlement has evolved to include seven expanding dairy farms, two schoolhouses, an Amish-run store, a successful sheet metal business, and more, Noah emphasizes that it’s all still something of an experiment.  [T]he settlement in Fort Fairfield isn’t Maine’s first Amish community. That honor goes to an Amish settlement in Smyrna, about 50 miles southwest, first established by several families from Tennessee in 1996. Both the Smyrna Amish — who’ve since spun off “sister” communities in Unity and Hodgdon — and the Fort Fairfield Amish identify as “Old Order,” a branch of the faith that fits most Americans’ mental picture of the Amish. Old Order Amish dress plainly, the men in simple suits, the women in dresses and bonnets; they drive horse-drawn buggies and plows rather than cars and tractors; and they eschew the electric grid in favor of oil lamps, woodstoves, and iceboxes. But the Amish faith is anything but monolithic, and even within the Old Order there’s room for considerable variation. The Smyrna Amish, for example, derive from a somewhat progressive Amish splinter sect: They ride bikes, use telephones, and gather in a freestanding church for services in English. The Fort Fairfield Amish, meanwhile, do none of these things, affiliating with a more conservative tradition known as the Troyer Amish. Worship in Fort Fairfield is held every other week in a rotating slate of members’ homes. The three-hour services are conducted in the dialect known as Pennsylvania German or Pennsylvania Dutch, which the Amish use among themselves, and the hymns — some of which last for 30 minutes — are sung a cappella from a 450-year-old songbook called the Ausbund. Many of the Ausbund’s hymns recall the martyrdom of the faith’s Anabaptist forebears in Reformation-era Europe. 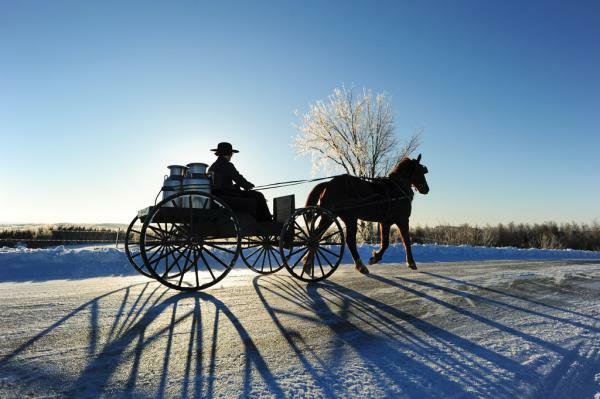 Persecuted for their embrace of adult baptism and rejection of the church’s role in politics, the Swiss-German sect known as the Amish started migrating to the U.S. in the early 18th century. The religion languished in Europe, and today, the Amish are a distinctly American ethnic group — and a rapidly expanding one. At the turn of the 20th century, there were around 6,000 Amish in the U.S., most concentrated in northern Indiana and southeastern Pennsylvania. Today, there are more than 280,000 in 31 different states, plus a few communities in Canada and Latin America. 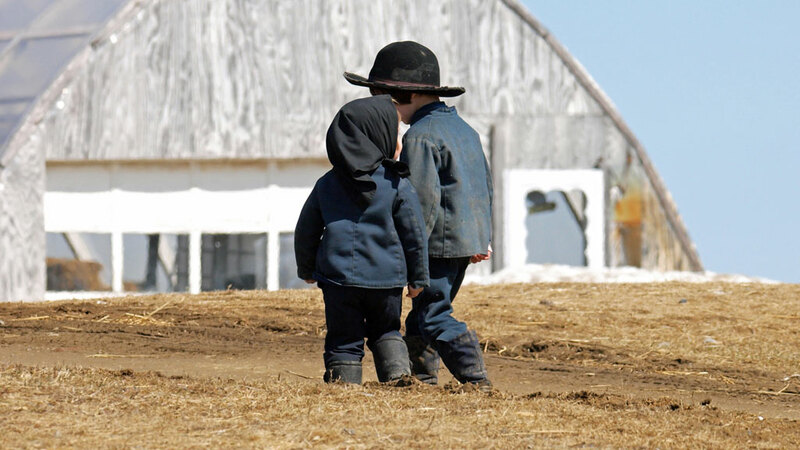 The country’s Amish population has grown by a whopping 20 percent in the last five years, and during that time, Maine has welcomed more than 40 Amish families. Only New York has seen a higher net increase in Amish households. 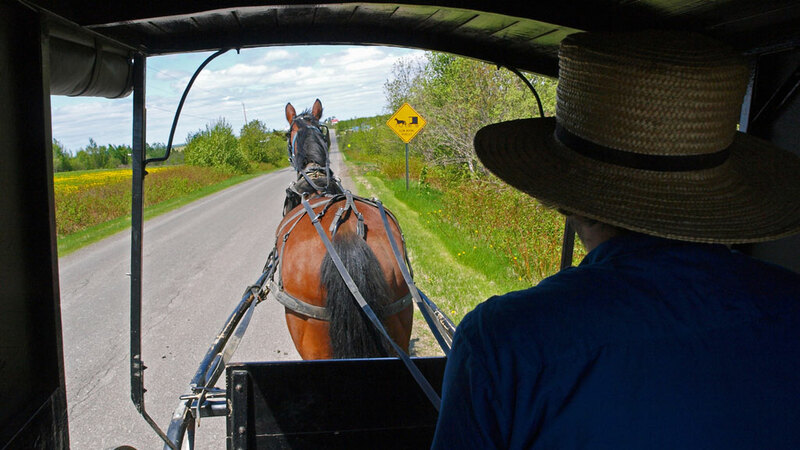 The Amish interpret the Bible literally, keying in on commandments to “love not the world” and to “come out from their midst and be separate,” rejecting the comforts and temptations of earthly living. Those of us who do love the world, or at least tolerate it, are simply referred to as “the English.” Just how separate the Amish keep themselves from the English varies from community to community. Subsistence farming once allowed Amish families a high degree of isolation, but today, occupations among the Amish are more diversified and — particularly in a small community — more reliant on commerce and contact with the English. In fact, part of Fort Fairfield’s initial appeal was its proximity to markets in Presque Isle and Caribou for Amish goods and services. 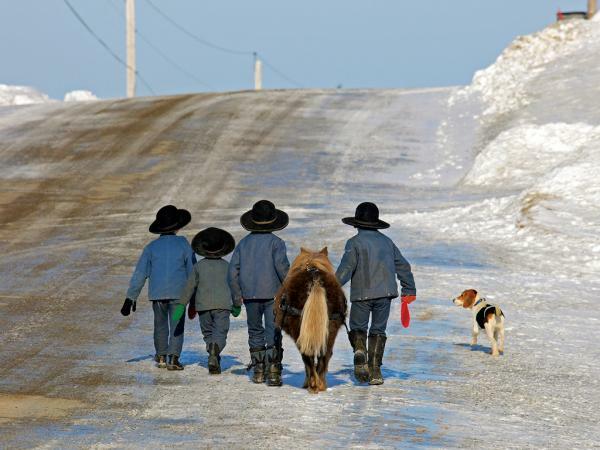 The country’s Amish population has grown by a whopping 20 percent in the last five years, and during that time, Maine has welcomed more than 40 Amish families. Only New York has seen a higher net increase in Amish households. 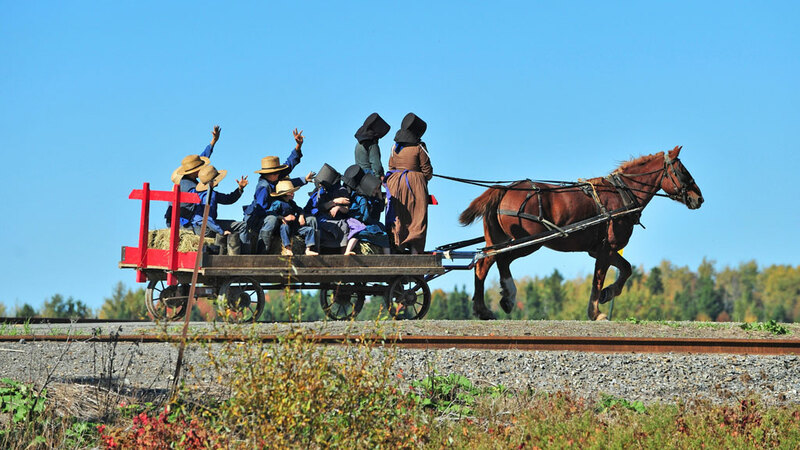 Still, the phenomenon of Amish tourism has yet to arrive in Aroostook County, which suits Noah and most of his neighbors just fine. He uses the term “plastic Amish” to describes communities in Pennsylvania and elsewhere that welcome tour buses and offer buggy rides. In general, the Amish in Fort Fairfield seem to regard the English’s fascination with their lifestyle with a kind of tolerant bemusement. Well-meaning English friends have given Noah paperback Amish romance novels for his daughters, which he accepts politely and then uses to feed the stove in his workshop. Abe Miller, Noah’s friendly 27-year-old neighbor, rolls his eyes at heavily scripted “reality” programs like Breaking Amish or Amish Mafia, which purport to show Amish youth “going wild” or flipping over one another’s buggies. (I was too embarrassed even to mention a new show where rapper Vanilla Ice travels through Amish Country to learn about carpentry.) This is where many of his English neighbors get their first impression of the Amish, Abe says, and he gently admonishes them not to believe everything they see on TV. Maybe the most common English misconception about the Amish is that their various prohibitions — against driving, jewelry, mustaches, the Internet — are sacred religious edicts, like the Jewish boycott of shellfish or the Islamic taboo on gambling. But of course, the Bible doesn’t mention station wagons or search engines, and the Amish avoidance of such things has less to do with pleasing the Lord than with preserving community. Each local church group sets its own guidelines for dress, decoration, travel, technology, leisure, and even vices like cigarettes and alcohol. Known as the Ordnung, this set of usually unwritten rules is subject to change — the Fort Fairfield Amish recently embraced compressed air power tools, for example — and much of its goal is simply to reinforce Amish identity and interdependence. Put into action, that inter-dependence is a sight to behold. It’s a bright fall day in The County, and Jacob Gingerich has a barn that needs finishing. At 26 years old, he’s been married and on his own for five years, and he wants to open a machine shop in the bottom half of his split-level farmhouse, which is currently used as a stable for his horses and goats. The first snow is just weeks away, and so far, only the barn’s frame is up. So the men of the community descend on Jacob’s farm for a smaller-scale barn-raising called a “work bee,” which Jacob graciously invites me to observe — although not to participate in, for reasons that are quickly self-evident. 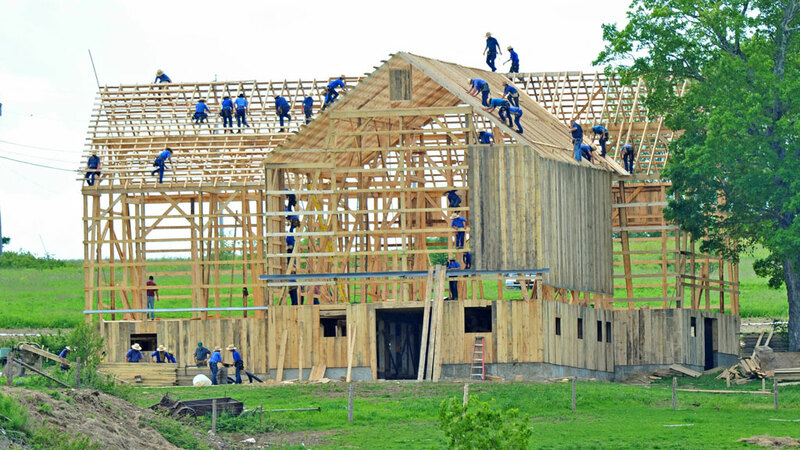 Watching 16 Amish men work together to construct a barn is like watching a Broadway musical of Amish men constructing a barn. Everything seems choreographed. Stretched across the rafters is a chorus line of blue-coated workers, all pounding nails in near-unison before gliding en masse to the next purlin board. Workers on the ground casually toss hammers and handsaws up to their counterparts, who catch them mid-stride, like partners in a juggling act. Nobody uses the ladders, preferring instead to shinny up and down the blond bones of the barn-in-progress. One crew is rapidly affixing red siding while another cuts girder-length two-by-fours with a gas-powered table saw, running them through the machine and hoisting them onto the roof in what seems like a single fluid motion. 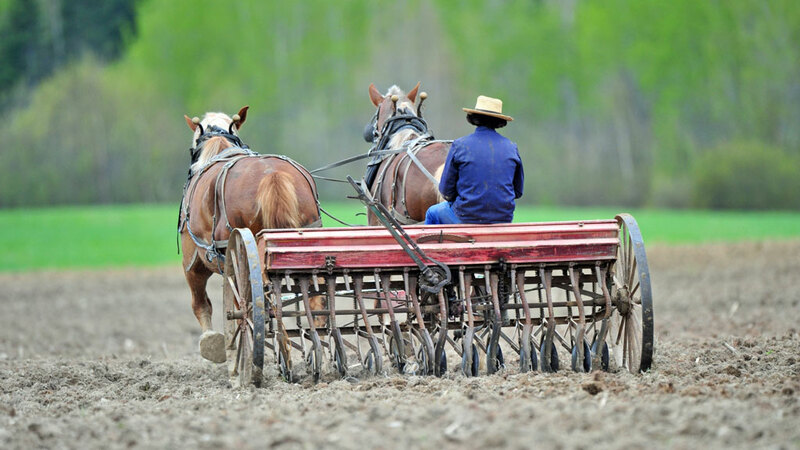 Behind the clamor of the tools there is laughter, the whinnying of horses, and the mealy lilt of Pennsylvania Dutch. At break time, we all stand inside the half-finished barn, eating peanut butter cookies and drinking weak coffee from a pair of stockpots that Jacob’s wife silently sets out. For the most part, Amish women are homemakers, and the partition between men’s and women’s work is fairly rigid — it would be quite rare to find an Amish woman participating in the raising of a barn. Over cookies, I chitchat with Abe Miller, Noah’s young neighbor, who works in his dad’s sheet metal shop. It is impossible, I tell him, to stifle the glum realization that if this were my barn, I wouldn’t even have fifteen friends I could call up to help. Abe, who’s only been married a year, strokes his comparatively wispy beard. 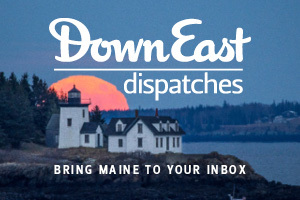 During those first few years in Maine, Noah’s updates traced the community’s early successes and growing pains, announcing newly arrived families, reporting calving numbers and minor injuries, and noting the frosts that fell early and stayed dismayingly late. For the settlement’s New York transplants, the New England winter was a mild challenge; for others, it came as something of a shock. 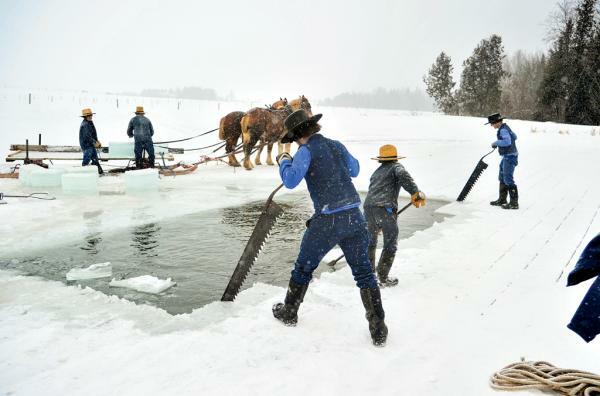 In Kentucky, Uri was a farrier who’d never driven his buggy through a blizzard or cut ice from a frozen pond. 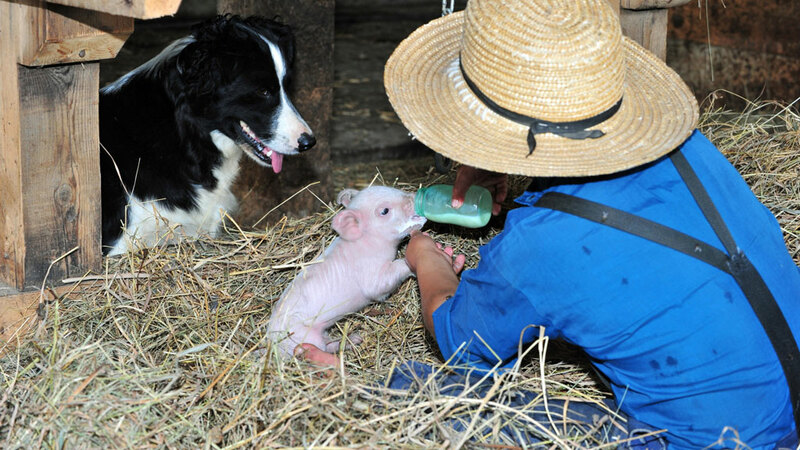 He came to Maine to fulfill a dream of starting a dairy farm. Like Noah and the rest of his neighbors, Uri dabbles — he grows some vegetables, keeps chickens, taps a few trees — but his main gig is now grazing and milking his twenty dairy cows. 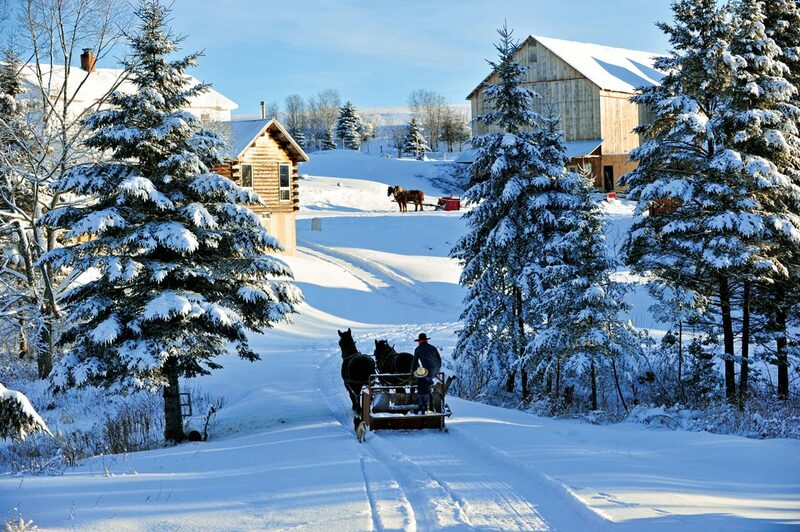 Unlike crop farming, it’s a year-round pursuit that complements the Aroostook climate, and since 2008, a half-dozen Fort Fairfield Amish have joined the Agri-Mark dairy cooperative, makers of Cabot cheese. Uri and the other farmers milk by hand into stainless steel buckets, which they strain and deliver by buggy to one of two milking houses. Since the sheds use electric-powered refrigeration, Agri-Mark leases the buildings from the Amish, owns the equipment, and pays the electric bill, deducting the cost from Amish profits. An English milk-truck driver interacts with the machinery, picking up six or seven thousand pounds of milk from Fort Fairfield every other day. It’s an adaptive arrangement that allows the Amish to thrive without compromising their principles. 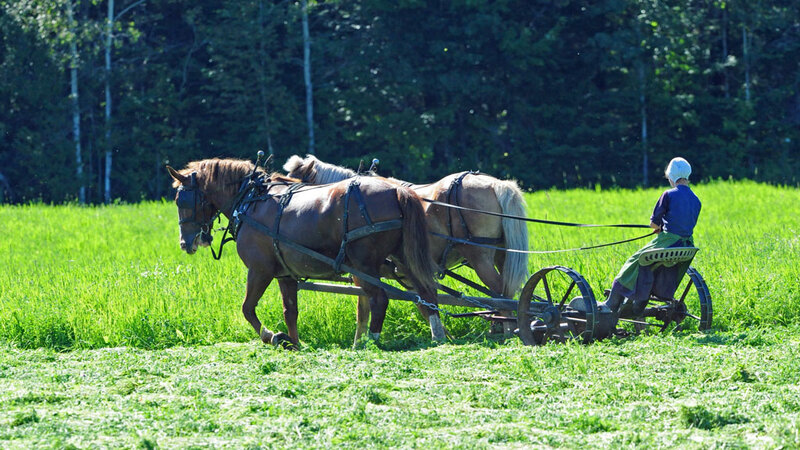 As not particularly Amish as it sounds, Noah explains that this willingness to adapt in small, creative ways is part of what makes a new Amish community successful. The Fort Fairfield Amish live with the possibility of failure in a way that’s tough for the rest of us to understand. I can move tomorrow, all alone, to Maine’s remotest corner, and if there’s a road to Hannaford and a 3G signal, I’m pretty much good. But because of their reliance on one another, an Amish settlement can unravel over small obstinacies and personality conflicts. Noah has seen whole communities dissolve over disagreements about whether and how to follow local building codes. What’s more, the burdens of any one family are shared by everyone, meaning that hardships like failed crops, house fires, and medical bills can pose challenges for the whole community. So far, Noah says, the Fort Fairfield Amish have proven cooperative and resilient, and he can’t think of any instance when he’s regretted his decision to settle in Maine. And yet, there have been exceedingly difficult moments. Last February, Noah wrote to Die Botschaft with the news that his oldest son, Roman, had been killed in a car accident during a heavy winter storm. Roman was riding in a car driven by an English neighbor, not far from the Yoder homestead, in the kind of whiteout conditions that can crop up suddenly in the wide-open farm country. When the car slowed to avoid an existing accident, a loaded logging truck struck it from behind, crushing the car and instantly killing twenty-two-year-old Roman. The Fort Fairfield settlement was never as tight-knit as in the weeks following the crash. Roman was buried with a simple headstone on the Yoder farm. The family received more than four hundred letters of sympathy — from extended family, English friends and neighbors, and strangers who read of the accident in Die Botschaft. Noah remains touched by the outpouring, although he acknowledges that it’s impossible for anyone who has never lost a child to comprehend the magnitude of the grief. Some burdens are simply too difficult to be fully shared. [T]he ability to overcome tragedy is one hallmark of a successful community. The embrace of its neighbors is another, and the Amish in Fort Fairfield aren’t the only ones hoping that their settlement continues to thrive. On the whole, the area’s Amish families have a warm relationship with their English neighbors, who drop in like farmers have always done to chew the fat, offer rides into town, or see about a helping hand on this or that project. Marion Cassidy was one of the first neighbors who Noah met in 2007, when he knocked on her door to ask about some land. She and her husband Jim, a retired potato farmer, have lived in Fort Fairfield for 57 years, and she speaks for many in the area when she says that it’s good to see the Amish families continuing The County’s agricultural traditions. Noah speaks fondly about his English neighbors as well. He genuinely enjoys the company of others, and he’s philosophical about the ideological distance between the Amish and “the world” from which they set themselves apart. 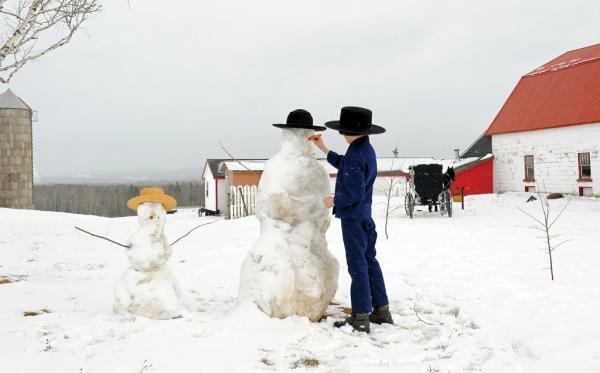 See more of Paul Cyr’s photos from Aroostook’s Amish country. 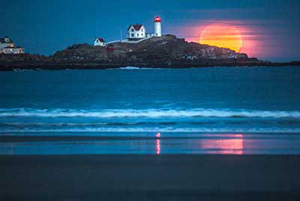 Wow, what amazing photographs! Thank you for re-publishing this story. So deeply inspiring. May we learn from these people!